Rest with me a while. You have journeyed up a steep, rugged path in recent days. The way ahead is shrouded in uncertainty. Look neither behind you nor before you. Instead, focus your attention on Me, your constant Companion. Trust that I will equip you fully for whatever awaits you on your journey. 8 Let the morning bring me word of your unfailing love, for I have put my trust in you. Show me the way I should go, for to you I entrust my life. The rascally rabbit won and I lost. Big time. Two days have gone by and I’m just starting to move about the house. Guess rabbit is not good for my nerves or anything else. The weird diet needs to be adjusted! At least the dog likes it! Dogs can eat anything ya know . . .
My prayer today is for this nightmare to end. I asked my hubby Steve if he thought there was something I was to learn from this illness that I wasn’t getting? He said that maybe it’s like Job (of the Old Testament). Job lost everything except His wife and a few skeptical friends when the Lord allowed Him to be tested. God wanted to show Job’s faith to a conniving Satan and gave Satan free reign to destroy Job, but not kill him. Job endured: he did question God at one point then quickly humbled himself before God Almighty when God spoke to him. Job had it much worse than I could ever imagine. Covered in boils, heartbroken from the loss of all of his children and possessions, and all at a time when he had been living a God-honoring life. My year-long illness, loss of my parents and brother, abusive childhood, heartache when my former spouse took so much, condo fire, and throwing up 12 times Tuesday night still did not compare to Job’s losses. And I doubt my faithfulness compares either. I am too quick to complain. I am too quick to want more. I am too impatient at times. And I just ain’t grateful enough. The Lord has grown my faith, softened my heart over the years. He has blessed me, restored me beyond measure. I have so much for which to be thankful. So why do I want more? Why do I want it all and right now? I believe it’s because we are all hard-wired to want something that we cannot have in this life. We are created to seek that which can only be satisfied in the person of Jesus Christ, in loving Him and letting Him fill our thoughts and times of longing. While I do seek Him continuously, I must let more go at the foot of His cross AND LEAVE IT THERE! He is worthy of my praise. He is honored when I go to Him with my hurts and needs. He loves me and knows my heart, I know. I must trust Him even when I cannot see Him clearly. My faith must grow even more. 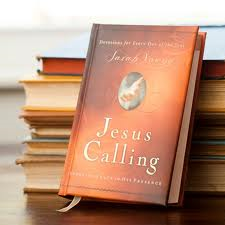 Writer Sarah Young understands this process well in her book, Jesus Calling. Because the world is in an abnormal, fallen condition, people tend to think that chance governs the universe. Events may seem to occur randomly, with little or no meaning. People who view the world this way have overlooked one basic fact: the limitations of human understanding. What you know of the world you inhabit is only the tip of the iceberg. Submerged beneath the surface of the visible world are mysteries too vast for you to comprehend. If you could only see how close I am to you and how constantly I work on your behalf, you would never again doubt that I am wonderfully caring for you. This is why you must live by faith, not by sight; trusting in my mysterious, majestic Presence. So I am in the middle of a Great Mystery, written by my Father and King. My prayer today will now change to learn to rest in His care until His truth, purposes, and blessings are revealed. Like an adventure of sorts. I wouldn’t stop reading a great book of fiction in the middle chapters when the antagonist is winning and the protagonist is lying shredded on the ground. Yeah, it’s not that bad. Time to take a shower now.